Synopsis: The dwarves, along with Bilbo Baggins and Gandalf the Grey, continue their quest to reclaim Erebor, their homeland, from Smaug. Well it’s a year later and I’m happy to say that Jackson must have listened to me ( 🙂 ) because The Hobbit: The Desolation of Smaug represents a significant improvement in almost every area that wasn’t quite up to snuff the first time around. Though the film is still overinflated to fill out the requirements of a trilogy, there’s more action to hold your attention and some incredible effects sequences that had me on the edge of my seat. Seeing it again in 3D HFR I found the projected image a lot easier to adjust to, with only a few select sequences coming off as funky due to the way the HFR affects movement. Picking up where the first film left off (after a brief prologue that comes before the events of the first film), we are once again partners on a journey with Bilbo and the dwarves in their quest to make it to The Lonely Mountain to reclaim their rightful homeland. Along the way they encounter a bevy of roadblocks like large spiders, shape shifting men, fiendishly rendered orcs, and combative elves…all trying to knock them off their path toward the mountain. Of course, it’s all a means to an end because anyone that has read the books or seen the previews or read the title knows that a meeting with the destructive dragon Smaug is pending. 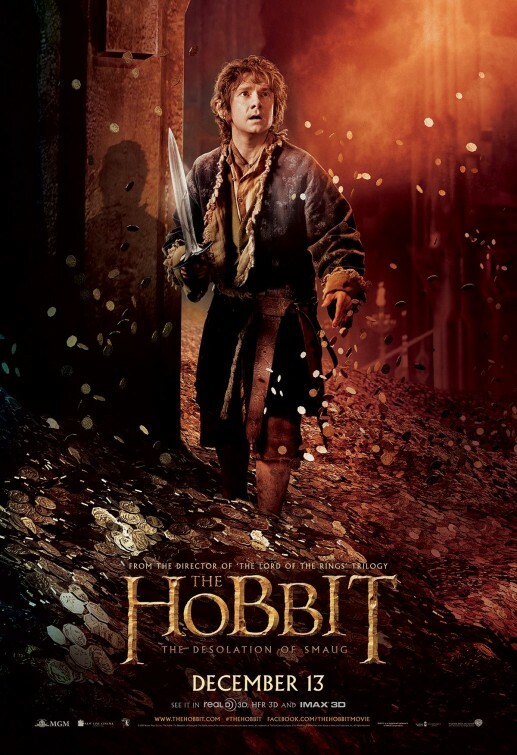 Whatever you may think about the first 2/3 of the film, it’s the final act where Bilbo comes face to face with the fire-breathing monster where the film earns some major brownie points. Smaug, (voiced by Benedict Cumberbatch, Star Trek: Into Darkness, 12 Years a Slave) is a stunning creation of visual effects, seamlessly blending in with the live action sets and stars – the digital titans at the special effects company WETA have truly outdone themselves here. Though the time flies once the dragon appears on screen, I did find the first chunk of the movie easy to sit through even if my mind wandered more than I’d like and my eyes drifted to my watch on more than one occasion. Though Evangeline Lilly’s sylvan elf character Tauriel was created solely for these final two films, I found her presence to be very strong. The bad part is that her supposed romance with dwarf Kili unfortunately adds lengthy time to the already long movie and isn’t really necessary or truly integral to the plot. Who knows how this romance will factor into the final film but it did feel like extraneous filler to stretch out the running length. Overall, this film really delivers the goods. Though it’s clear now that The Hobbit films won’t be able to topple the original trilogy, fans of Tolkien’s work or Jackson’s previous Lord of the Rings films should find more reasons to like this second installment while being reminded once again how special that original trilogy was. Ending with a dynamite cliffhanger, a year seems too far away to be able to finish the journey in middle earth. If you had asked me a year ago, I’d have said that a year wasn’t long enough. A grand improvement of a film.